Spent most of Tuesday running around with family errands, like taking My Little Overlord for her vaccinations and doing the groceries. By midday, we were desperate for a sugar fix, so it was off to J.Co because doughnuts, right? For the record, I’m not big on fancy doughnuts because I usually find them too sweet. Just the sight of a frosted doughnut laden with chocolate bar bits makes my teeth ache. The exception I make is J.Co because the sweetness level of most of their flavors are aligned with my own preferences. That, and the way their doughnuts are so pillowy soft that biting into a fresh doughnut messes with my mind. Am I eating something, or am I eating dreams, rainbows, and unicorns? And since we’re talking exceptions, the fact is, I’m mostly iffy about adding coconut to things. Sure I love buko juice like any Pinoy. I love old school coconut macaroons and shredded coconut on palitaw is something I enjoy. But coconut in my coffee? My instincts say pass, but I was sent on a mission to sample J.Co’s Coco Mocha Frappe, a coconut-infused blended coffee drink, and the Dazzling Dream, a strawberry and coconut confection of a doughnut. Thankfully, my fears were unfounded. The Coco Mocha Frappe’s coconut flavor lurked subtly in the background. You know it’s there, but it wasn’t intrusively shouting notice me, notice me! I enjoyed how the frappe was blended finely, leaving me with an empty tumbler at the end, unlike other blended coffee drinks that tend to leave a froth and ice residue. The Dazzling Dream doughnut was mostly just okay at first. It was a doughnut with strawberry frosting and desiccated coconut. My first thought was to stick to staples Blue Berrymore and Berry Spears. Then, I got to the creamy strawberry filling. It instantly went up a bajillion points on the berry scale and I finally got the dazzling part of its name. Taken by themselves, both of the highlighted products were yummy. But as a pair, it’s even better as the coconut in both complemented each other perfectly, strengthening the formerly subtle coconut nuances into a pleasant coconut fiesta that makes you happy to be in the tropics. So these two? Winning coco-mbo! Disclosure: Kitchen Cow received gift certificates from sponsor to purchase the above products for sampling. All text and photos are writer’s own. No monetary compensation was received. 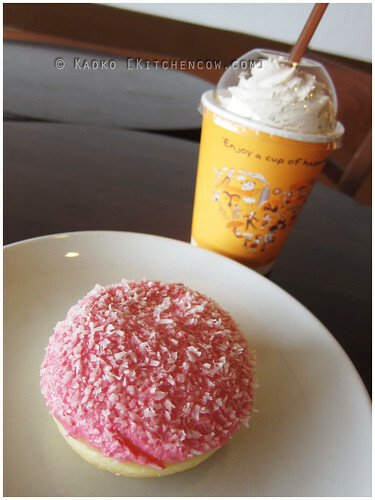 This entry was posted in food & cooking, where to eat and tagged coco mocha frappe, coconut, dazzling dream, doughnuts, j.co. Bookmark the permalink.